Owh.... we lost again today.. I can see that our team doesn't have the spirit and confidence to face this one team from I-dunno-where laaa... haha... we played at that Lembaga Getah Malaysia's field again and FIY, we keep on losing each time we play there. Haha.. no luck I guess playing there. 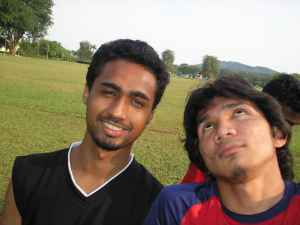 Hurmm... most of our players were lack of fitness and maybe feeling a bit tired coz they were playing football earlier. For example, me, Kerol and Papa played wit Juventus last night, Habeeb in a futsal game at 3 a.m this morning and Joe and his friend (Azam) were involved in their faculty's football team selection during the afternoon... so.. that's why we lost!!! Iji, Habeeb and Ihsan.... berborak... luar or dalam padang pon same aje..
".. Ihsan ni.. benda lain plak yang melompat aku tengok.. hahaha... "
" hehey.. Sat looks like Louis Saha.... "
td pagi kt klas muazli tanye result lwn match...cm mane die tau ktorg ade match pn aku x tau..aku ckp kalah 2-0...haha...gile ape ckp 6-0...aku nk ckp pn malu...haha. mmg fanstasy football la team aku...my 1st 50 pts in f fball...best gile...aku dpt no 4 kt liga ko diz week...x sabar plak lpas ni...hehe...tp aku turun gak jp lg bab aku buat transfer td...x puas hati dgn team line up...haha.